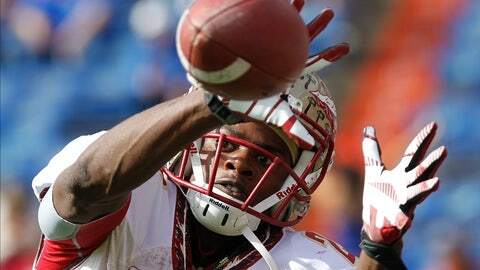 Senior Lamarcus Joyner, a consensus All-American, was a part of the Seminoles' 2010 recruiting class, ranked ninth by Scout.com. TALLAHASSEE, Fla. — Through the latter half of the 2000s, it was clear that Florida State was struggling on the field because of its recruiting misses. The state’s top players were committing to Urban Meyer and the Florida Gators. Florida State wasn’t completely lacking in talent, but there wasn’t enough of it in Tallahassee to compete. 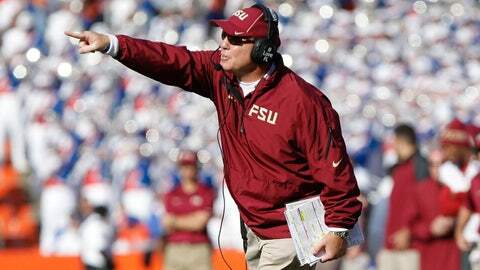 And it showed up in the win-loss totals, as Florida State went 7-6 in 2006, ‘07 and ’09. Jimbo Fisher rebuilt Florida State’s program by stacking one good recruiting class on top of the other. In the days after Bobby Bowden was dismissed into retirement in December 2009, Fisher spent a week traveling around the state trying to convince four- and five-star prospects that he would turn things around at Florida State. Fisher’s 2010 class was ranked 9th by Scout.com, and it included a five-star defensive back in Lamarcus Joyner (now a consensus All-American). But that was just the start. Bob Ferrante breaks down what is key for Florida State to come away with a victory from Pasedena. The 2011 class was ranked No. 1 in the nation by Scout.com. That class included running backs Devonta Freeman and James Wilder, as well as a safety (Karlos Williams) that converted to running back. Two of this year’s top receivers, Rashad Greene and Kelvin Benjamin, are in the group. So are tight end Nick O’Leary and three offensive linemen. "That’s a pretty good class," Fisher said. "We thought it was special. But I’ve been in this business long enough to know that sometimes they don’t always pan out." They certainly panned out. The 2010 and ’11 classes have made all the difference in the Seminoles’ 13-0 season, putting them just a win over Auburn (12-1) on Monday night from a national championship. While the 2012 and ’13 classes haven’t fully shown their full potential, Florida State did land the nation’s top dual-threat QB in 2012 in Heisman Trophy winner Jameis Winston and a pair of defensive backs in 2013 (Jalen Ramsey and Nate Andrews) that became immediate starters. Analysis: Luc was Fisher’s first verbal commitment in December 2009. The linebacker from Port St. Lucie never fit into the Seminoles’ defensive schemes, and he transferred to Cincinnati before the 2012 season. Joyner has been a consistent player both at corner and safety. He was named a consensus All-American this season at corner (64 tackles, five sacks). Shaw is having a career year as a senior (52 catches, 929 yards, six TDs). Erving was a backup at defensive tackle to start his career but has flourished with the move to left tackle, and he could be a first-round pick. Smith is an undersized linebacker but brings energy to the defense and leads the team with 75 tackles. Jones has shown his versatility as both a linebacker and rush end, while Brooks was a diamond that Florida State uncovered from Florida’s backyard (Dunnellon is an hour south of Gainesville). The Seminoles have lots of qualities of an SEC team, but coach Jimbo Fisher says he didn't pattern his rebuilding effort after an SEC program. Analysis: This is easily the deepest signing class under Fisher, and for that reason has had the most impact. All of the five-stars have contributed as starters. Jernigan is considered one of the top defensive tackles in the nation and a first-round pick in the 2014 NFL draft if he leaves early. The 2011 class powers the offense. Freeman is 57 yards from a 1,000-yard rushing season. Williams smartly moved from safety to tailback and has done well. Wilder has been slowed by shoulder injuries but is a tough, physical runner. Benjamin has 14 TDs in 2013, and both he and Greene have more than 900 receiving yards this season. O’Leary has had a breakthrough year, grabbing 33 receptions for 557 yards and seven TDs. On defense, Smith’s emergence has strengthened the linebacking corps. Hunter had a neck injury this season but is doing well in his rehabilitation and will return in 2014. Analysis: Florida State went into Alabama and won big when it landed Winston, who was considered the top-dual threat quarterback in the nation. He has thrown for 3,820 yards and 38 TDs in his redshirt freshman season. Maguire has filled in frequently in the second half, stepping in and showing his grasp of the offense after No. 2 QB Jacob Coker was injured. The defense is stronger because of the five-stars in this group. Darby is a lock-down corner who quarterbacks have not tested often. Williams has developed into a starter. Goldman and Edwards don’t have impressive sack totals, but they have consistently beaten offensive lineman and have been key in stopping the run. Casher is still developing. And when scholarships opened up in the summer of 2012, Fisher was able to bring in PK Roberto Aguayo and redshirt him. Aguayo was scheduled to grayshirt, which meant he would have enrolled in January 2013, but when a scholarship became available Aguayo was able to learn alongside then-senior PK Dustin Hopkins. Analysis: Most members of this group have played backup roles as they learn the offensive and defensive schemes. It’s clear that players like Green, DE Demarcus Walker, OL Wilson Bell and a trio of receivers (Isaiah Jones, Jesus Wilson and Levonte Whitfield) are part of the long-term plan. Ramsey has started every game, first at corner and then at safety. He has 44 tackles and an interception. Andrews figured to redshirt, but he has made an immediate impact in recording 31 tackles and grabbing four interceptions. Whitfield had two rushing touchdowns and a kickoff return for a TD. Green also had a rushing TD. Thomas was playing well as a backup linebacker until a shoulder injury ended his season in mid-October.